It took only a few years for Guangzhou OED Technologies, a Chinese enterprise engaged in the production of electronic paper, to develop the world's first graphene electronic paper. The company was established in 2008 in Nansha, a southern district in Guangzhou, the capital of Guangdong province. 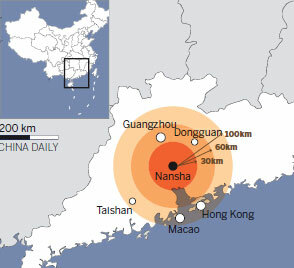 "Our major technological breakthroughs are due to a number of factors, principally our increased efforts in research and development, and a sound and healthy business environment, especially in the technology and innovation sector in the booming Nansha district," said Chen Yu, chief executive officer of Guangzhou OED Technologies. Compared with traditional e-papers, e-paper made of graphene is more pliable and its higher light transmittance means that it produces much brighter optical displays, according to Chen. "The new e-paper uses graphene and is expected to not only boost the use of the material worldwide but also help expand the commercial scale of the e-paper industry," said Chen. After returning from the United States in 2005, Chen began working at the Guangzhou-based Sun Yat-sen University, where he led a team in the research and development of e-paper display technologies. "E-paper display technology is of great importance to the process of industrial upgrading in the Pearl River Delta region," said Chen. Chen established the company in 2008 with the support of angel investors in Nansha district, which is now part of the Guangdong Pilot Free Trade Zone. "The local government has created a sound and healthy business environment for tech startups, which has helped us grow at a rapid rate and enabled us to develop advanced technologies," said Chen. The company is now one of the two major electronic paper display producers and suppliers in the world, engaged in the research, development, manufacture, assembly and marketing of thin film electrophoretic displays, primarily panels for e-readers, electronic shelf labels and other related low-power display applications. Dozens of high-tech companies similar to OED Technologies have emerged in Nansha in recent years, due to huge local government investment aimed at creating a stable and nurturing business environment. Nansha, which is also a pilot zone for nationwide self-innovation, is positioned to become a base for high-tech and strategic emerging industries, as well as a hub for international technology and innovation, according to sources with the local government. Nansha might be an ideal model for G20 leaders to examine as they seek innovative solutions for their economies, according to insiders. The district, with an area of 803 square kilometers, is currently developing six technology and innovative bases in its Qingsheng, Mingzhu Bay, Huigu, Wangqingsha, Sanmin Island and the Eastern Pearl River areas. Within the six innovative bases, 76 local high-tech companies engaged in information technology, energy-saving and environmental protection and biochemical and pharmaceutical sectors have emerged as catalysts for the local economy. "A number of local companies have become industry leaders, thanks to increased investment in technological research, both from the companies themselves and the government in recent years," said Xie Ming, deputy director of the Nansha Development Zone Administrative Committee. Seven local companies have also been listed on the New Third Board, or National Equities Exchange and Quotation System, which serves as a national share transfer system for small and medium-sized enterprises to transfer shares and raise funds. The local government has in recent years introduced a series of supportive and innovative measures to encourage high-tech industrial development. The measures have proven effective even amid the economic slowdown. Last year alone, the Nansha district government invested 532 million yuan ($79.96 million) in technological research, a more than seven-fold increase on 2010, according local government sources. The district has now established three national-level laboratories, with 65 innovative platforms covering various engineering and technological projects. According to the local government, an investment fund for the innovation industry has been established in Nansha, from which 500 million yuan will be allocated within the next three years to help introduce international investment organizations. "The investment fund will help support the development of more SMEs, especially in the technology and innovation sector," said Xie.